Escape to Overleaf Lodge & Spa, one of the Pacific Northwest’s premier spa vacation destinations. Unwind in our cozy ocean suites and discover the galleries, shops and restaurants in town. Explore miles of tide pools, hikes, sandy beaches and natural wonders just outside our door. 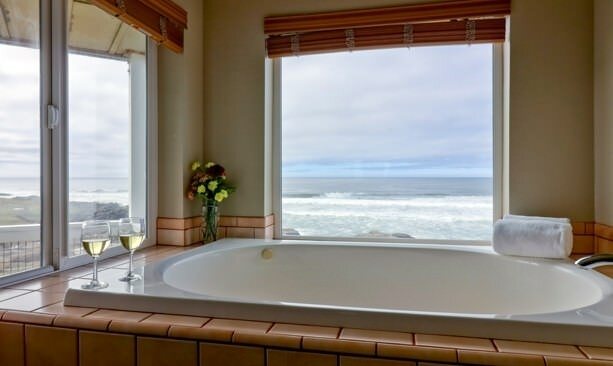 The Overleaf Lodge sits at the cliff's edge in Yachats on Oregon's central Coast, where it's easy to sip wine, whale watch and unwind. 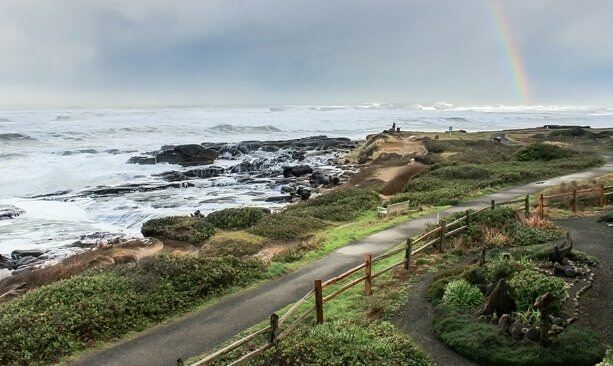 From downtown Yachats, find easy access to the 804 Trail, a 7-mile stretch that follows the pristine coastline. A favorite Yachats dinner spot is Ona Restaurant & Lounge, with their upscale global cuisine and handcrafted cocktail program. Rooms at Overleaf Lodge feature fireplaces, balconies, kitchens and two-person bathtubs overlooking the sea. Sometimes you need to unplug and rejuvenate. That’s easy to do in Yachats, the little coastal town on Oregon’s Central Coast where you might look up from your crab cakes to admire a bald eagle wheeling overhead or a grey whale spouting beyond the surf. With innovative restaurants and shops and the forest and ocean as your playground, it’s a breeze to fill three days with activities — or just gaze at the waves and revel in quiet solitude. Start at Luna Sea Fish House, where owner Robert Anthony catches the albacore, halibut and salmon. Fish and chips star, seducing with light, delicate batter. If the 18-seat cafe is packed, try LeRoy’s Blue Whale, a family seafood diner. 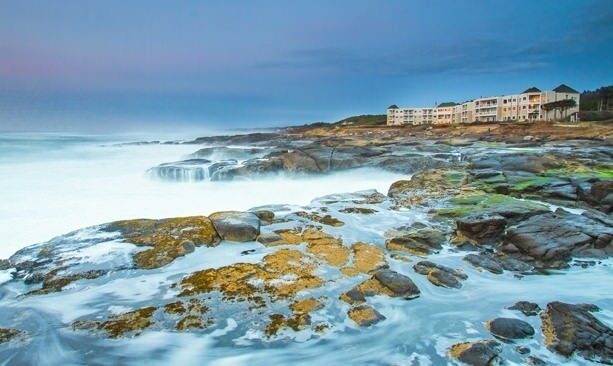 After lunch, check in at the Overleaf Lodge and Spa, which boasts 54 rooms with magnificent views of crashing surf and whales that migrate along the Coast. Seven room types combine features like fireplaces, balconies, kitchens and two-person bathtubs overlooking the sea. Browse the artwork, including massive sculpted driftwood and colorful glass installations evoking the tide pools just outside. Enjoy an afternoon walk on the 804 Trail. Named after the primitive road that preceded Highway 101, it traces the coastline north to seven miles of sandy beach, and south into town and beyond. Back at the Overleaf Lodge, visit the lodge’s wine cove for a local bottle to sip at sunset. The lodge partners with Prairie Mountain Wineries, a group of six neighboring wineries near Eugene, and hosts educational weekend wine and beer tasting events presented by the makers. 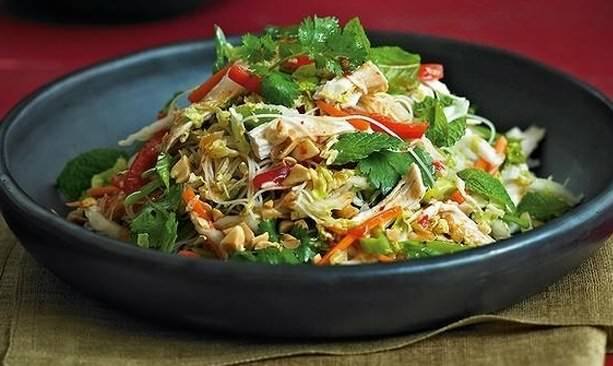 Explore Ona Restaurant & Lounge‘s imaginative global menu for dinner. Gata, a Filipino coconut ginger seafood stew, and braised lamb shanks impress, paired with a cocktail program showcasing house-infused liquors and hand-crafted syrups. Top off the evening with a few games of pool, darts or shuffleboard at Outta Gas Pizza, then slumber to the melody of crashing waves. 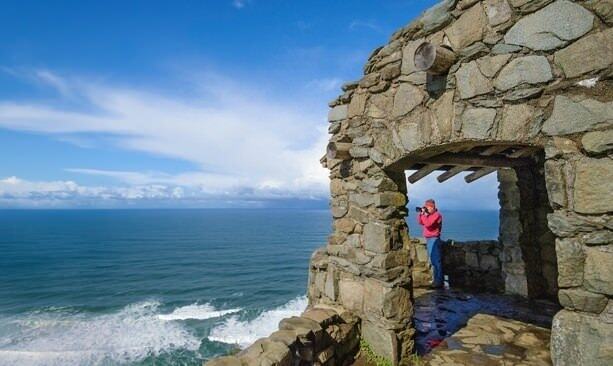 After a housemade breakfast at the Overleaf Lodge, drive 10 minutes south to Cape Perpetua Scenic Area and pick up a $5 day-use pass at the visitor center, where you’ll find panoramic vistas, nature films and exhibits. Explore 26 miles of interconnected trails winding through old growth forests of Douglas fir and Sitka spruce, drive or hike to the 800-foot summit, the highest point on the Oregon Coast. Don’t miss the extraordinary tidal display at Devils Churn and Spouting Horn, two dramatic blowholes. Marvel at Thor’s Well, where the raging Pacific seems to drain into a bottomless pit at high tide. Just remember to follow beach safety rules, like: Never turn your back on the ocean, stay off logs in the water and avoid standing on exposed rocks, jetties and headlands after a storm. Worked up an appetite? The fermentation masters at Yachats Brewing and Farm Store craft beer, pickles, kraut and more. Try a grilled sandwich — the smoked local pork belly with cortida ferment and a 3-cheese blend on thick house sourdough is a show-stopper. Their long, diverse tap list pairs beautifully with their seasonal food menu; pick up a few bottles of their award-winning Salal Sour beer, made from buckets of handpicked berries on the Coast. Cross the street to Topper’s Ice Cream & Candies for dessert, where they make fudge and chocolates in a tiny production area, pull espressos and scoop ice cream. Spend the afternoon rejuvenating at the third-floor Overleaf Spa with a soothing massage treatment or facial. Luxuriate in spacious walk-in showers with smooth riverstone tiling. Gaze at the surf from the soaking tubs or linger in the sauna, both open to all Overleaf guests. Cap your day with a satisfying meal at Heidi’s Italian Dinners, a classic gourmet trattoria with a pasta-centric menu and an herb garden supplying the kitchen. The Dungeness crab ravioli wins raves. Walk around the block for a nightcap at the Yachats Underground Pub & Grub, or get cozy around the outdoor pit at the Overleaf, along with popcorn or s’mores and live music. Rise and shine with a flaky pastry at Bread & Roses Bakery & Cafe. A croissant filled with goat cheese and prosciutto or a “celestial snail” — a flaky pinwheel topped with fresh fruit and lemon curd — prompts a relaxing stroll. The small downtown in Yachats has a bookstore, gem shop, antique shop and more. 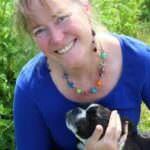 Browse among quirky locally made handcrafts, gifts, puzzles, camping gear, artwork, handmade outerwear and Oregon wine. Visit the Little Log Church Museum, then wander Yachats Commons Park, a restored marshland hosting ospreys nesting on elevated platforms. Enjoy a simple but satisfying lunch at Green Salmon, an organic, fair-trade coffee roaster with an extensive chalkboard list of hot and cold beverages as well as wholesome wraps, bagels and sandwiches. You may want to bring your wildflower field guide to Gerdemann Botanic Preserve, a 3.5-acre research collection of exotic shrubs and trees in the heart of Yachats. Make an appointment to visit first, then prepare to be immersed in the beauty of magnolia, camellia, rhododendron and more unusual plants that thrive in the coastal habitat. Just outside the Preserve, follow the public footpath from Earthworks Gallery to the brand-new Ya’ Xaik Trai, a 2.1-mile loop that connects with the Yachats 804 trail and the entrance of the Siuslaw National Forest. Cap your day back on the beach near the Smelt Sands Recreation Site, just a half mile south of Overleaf Lodge, where tide pools, shorebirds and driftwood invite sketching and photo studies. Search for agates, and keep an eye out for gray whales, Stellar sea lions and squadrons of pelicans as you await the sunset.